Lisa is always on the lookout for new rides at all levels of competition and extends a warm welcome to new owners, be it individually or as part of a syndicate. Whether you think your horse would simply benefit from Lisa’s expertise or you wish to purchase a future top eventer, Lisa is always willing to provide assistance. As an owner, you will receive regular updates on your horse’s progress, as well as the chance to watch your horse compete at events across the country. “Coming from forty years in the saddle to being a non-riding owner, with Lisa’s support, is so very rewarding. 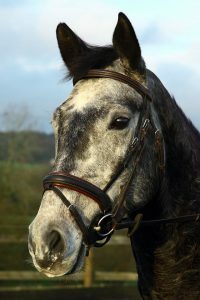 Lisa helped to choose him, a stunning and quality 5 year old who is now 9 and a happy member of her excellent team. Having watched Lisa compete for over ten years, I am now watching her bring Rocky on confidently through schooling and competitions. Please contact Lisa for more information about becoming an owner. Becoming involved in a sponsorship deal with Lisa will provide your business with plenty of advertising opportunities within the equestrian industry as she competes at many of the top events, both in the UK and abroad. For further information about sponsorship deals, please contact Lisa.